I desire to inform you that Security Affairs is now open to sponsored content. • Insert banners of various sizes in all the posts on Security Affairs. • Publish sponsored posts written by the customers that can include any kind of commercial reference. • Arrange a monthly/quarterly/annual campaign (for big customers) to advertise customers’ activities and discoveries. Thanks for supporting Security Affairs. 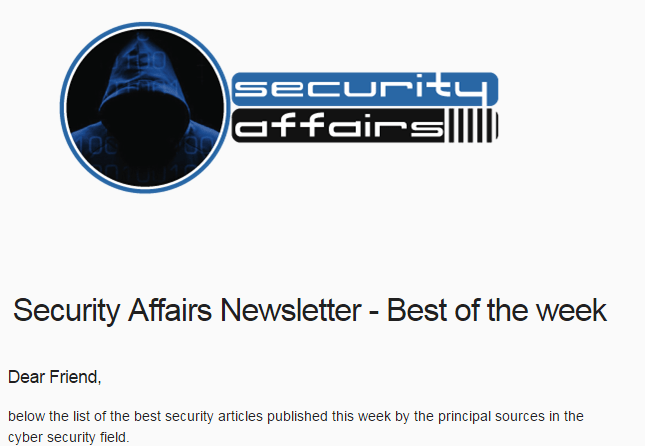 The post Security Affairs newsletter Round 53 – News of the week appeared first on Security Affairs.